Want to learn more about Whispers of the Old Gods ? Head on over to our Whispers of the Old Gods guide! Join the discussion on our forums! 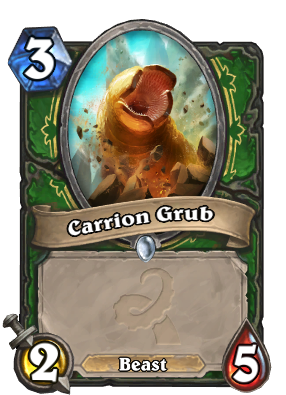 Come discuss Carrion Grub over in our dedicated Carrion Grub discussion topic. Surprisingly good in arena with Houndmaster! I guess this is a Giant Sandworm grub. Only explanation for a maggot being that fat, considering a sheep or even a Silver Hand Recruit are 1/1. Not that numbers make a lot of sense in this Game, but still. There'll be peace when you are done. Hah, I was actually listening to Kansas while casually looking into my collection to dust unplayable cards, noticed that expansion cards are already out and checked flavor text on random one. And it was THIS one. WHAT ARE THE ODDS? Best flavor text in the set! Ok. Honestly? Who writes this flavor text? Druid of the flame without versatility. Why is flying intestine a beast?